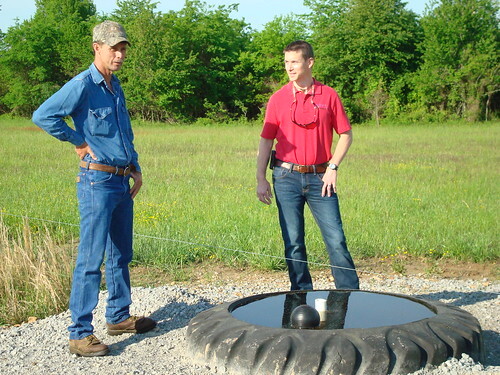 Dale Courtney (left) visits with Randolph County NRCS District Conservationist Adam Eades near an electric fence and tire tank watering facility about the resilience a good prescribed grazing program offers during a drought. Cattle producers across Arkansas faced many challenges during the extreme drought of 2012. Luckily, grazing management strategies helped farmers like Randolph County’s Dale Courtney alleviate the drought’s effects. 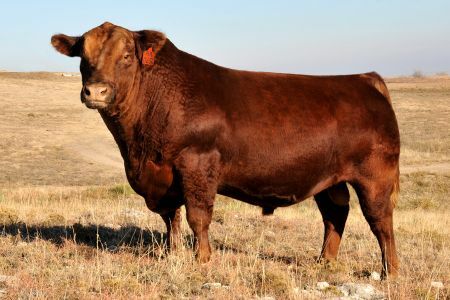 With the assistance of USDA’s Natural Resources Conservation Service, Courtney developed and implemented a conservation plan that included grazing management strategies, which helped to protect his operation from the worst of the drought and make it more efficient. Following the conservation plan, he added electric fence and pipeline to funnel water to new tire tank watering facilities in each of his pastures. Courtney also created several new pastures to allow him to move his cattle around more frequently. He implemented prescribed grazing, to make sure a minimum amount of plant cover was maintained at all times to protect the soil from erosion and compaction—this improves the quality of the forage by giving it time to recover before it’s grazed again. Prescribed grazing also improves water quality by preventing soil from eroding into the water supply. By relying on prescribed grazing, Courtney was able to avoid the cost of supplemental forage like hay, which—while never cheap—has become more expensive due to the drought. “With this system, I can go until January or February without feeding hay,” Courtney explains. He was also able to stockpile some of his cool season forages for use in the fall and early winter, saving even more money. Courtney’s cattle are provided water by fenced ponds that use a gravity flow system to supply multiple tire tank watering facilities. This saves him from having to use electricity to pump the water to the different pastures. “Mr. Courtney is an innovator; he’s a producer you can go to with new practices and ideas,” says NRCS District Conservationist Adam Eades. Courtney uses legumes, prescribed grazing and nutrient management to eliminate the need for commercial fertilizer. Cover crops like legumes can prevent erosion, improve the availability of soil water and supply nutrients like nitrogen. 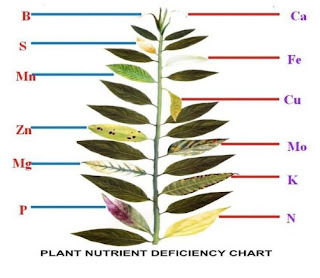 Legumes convert nitrogen gas in the atmosphere into soil nitrogen that plants can use, meaning manure or commercial fertilizer may be needed in smaller quantities or not at all. Working with NRCS, Courtney’s conservation plan helped get him through the drought, and his operation continues to be successful. Check out other conservation-related stories on the USDA blog.